Hotel website design services Sydney. SEO & Google ranking included. Sydney hotel website development experts. 20+ years experience. Wordpress experts. 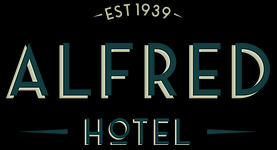 The Alfred Hotel is located at Camperdown in Sydney’s Inner West. New owners purchased this formerly run down pub and have breathed new life into it. 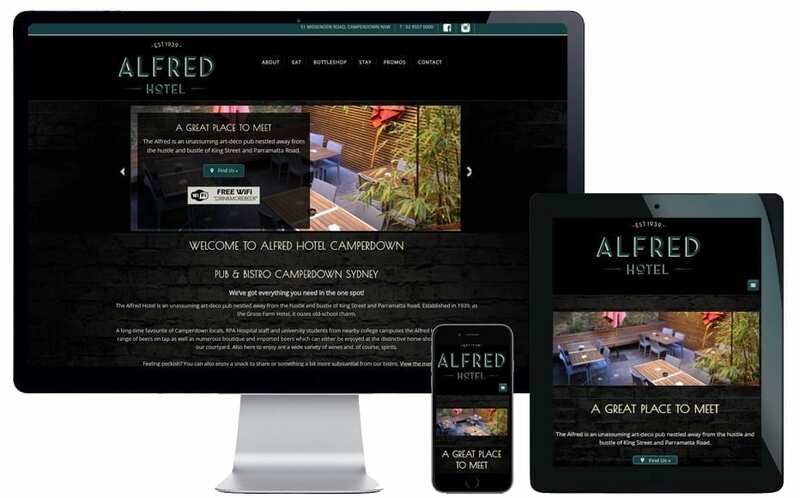 They wanted to bring this unassuming Sydney hotel into the 21st century with a stylish and welcoming new website, strong Google ranking and competitive internet presence. I was enlisted to design a new website that represented the charm, character and warmth of this lovely art deco Sydney hotel. The hotel is conveniently located in a bustling inner city precinct close to RPA Hospital and the University of Sydney so it was important that the website had a contemporary feel that would attract local residents, hospital staff and uni students. I wanted these broad demographics to feel the hotel was a comfortable “home away from home” where they could meet friends for a casual drink and meal any time of the day or night. Importantly, the website is mobile friendly and looks great on all devices including desktop computers, laptops, tablets and smartphones. As part of my SEO strategy I undertook extensive keyword research to ascertain what keywords potential customers were using to find an establishment such as the Alfred Hotel. My goal was to rank top of Google for local Inner West hotel searches, places to eat, entertainment solutions and affordable accommodation close to the University and Hospital. With this information I developed an SEO strategy for the entire website. This will grow and evolve over time with the addition of new content designed to affirm an ongoing page one organic Google ranking. The Alfred Hotel has everything Camperdown residents, workers and students need in one spot. An unassuming art-deco pub nestled away from the hustle and bustle of King Street and Parramatta Road, the Alfred Hotel was established in 1939 and oozes old-school charm. A long-time favourite of Camperdown locals, RPA Hospital staff and university students from nearby college campuses the pub offers a large range of beers on tap as well as numerous boutique and imported beers which can either be enjoyed at the distinctive horse-shoe shaped bar or in our courtyard. The new owners have introduced a wide variety of wines and spirits. Patrons can can enjoy a snack to share or something a bit more substantial from their bistro. The Alfred Hotel is the perfect place for a few quiet (or not-so-quiet) drinks with friends.